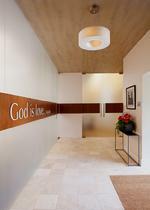 The new sanctuary of the First Church of Christ, Scientist, in Montclair is a fresh and modern space filled with daylight and modern lighting. The room’s focal point is the wood walls behind the lectern, held away from the wall to incorporate an uplight cove, graze light up to the decorative glass wall tiles. 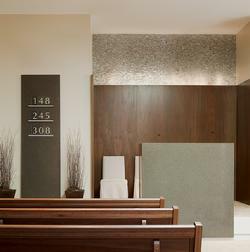 Accent lighting, concealed above and out of view, highlight the speaker’s podium and flanking stone slabs displaying the services scripture and choral information. Other lighting components include a reverse cove to highlight the perimeter walls with soft and diffuse light, an illuminated skylight well, and downlights above seating to ensure adequate light levels for reading.